Staying overnight at Villager’s House. Interact with Local Villagers and learn there culture. Pokhara day trek or comm=munity trekking known as Nepal Community Trek developed by famous personality Mahabir Pun. This Community trekking in Pokhara is a newly developed trekking route . It helps to uplift and support local communities of poor villages and head towards modernization. Pokhara day trek lets you get plenty of local cultural and traditional experience. It also offers great views of snow capped mountains while passing through beautiful villages, and staying in local community lodges. This trekking starts from Pokhara and head towards Galeshwor to Banskharka, Nangi . Nangi is also the home of Mahabir Pun, the person behind connecting village to the rest of the world through the wireless Internet. We pass through Nangi, then we head toward Mohare, Danda Kharka, Tilkot Village, Basheri and finally back to Pokhara. Pokhara trekking is a short and easy trekking journey at Annapurna region.It is suitable for everyone regardless of your age and fitness. This trek is low altitude trek, therefore there should not be any problem of altitude sickness. Join pokhara day trek with Euro Asia for great unique, different and delightful trekking experience. Contact Euro-Asia today and join our professionally organized pokhara trek with your family. We help you to create pleasing holiday experiences on the foothills of Annapurna Himalayas. Check our famous Kathmandu-Pokhara-Chitwan tour also. After having breakfast, we are going to do some sightseeing activities today. As planned, we are going to explore some of the most iconic UNESCO World Heritage Sites of Kathmandu city: Swayambhunath Stupa, Pashupatinath Temple and lastly Kathmandu Durbar Square and evening drive back to hotel. After having breakfast we will drive to Pokhara. A very scenic drive which lasts for about 6 hrs through the beautiful riverbanks & gorges. After reaching to Pokhara you will visit Seti gorge, Davis fall & Bindubasini temple. 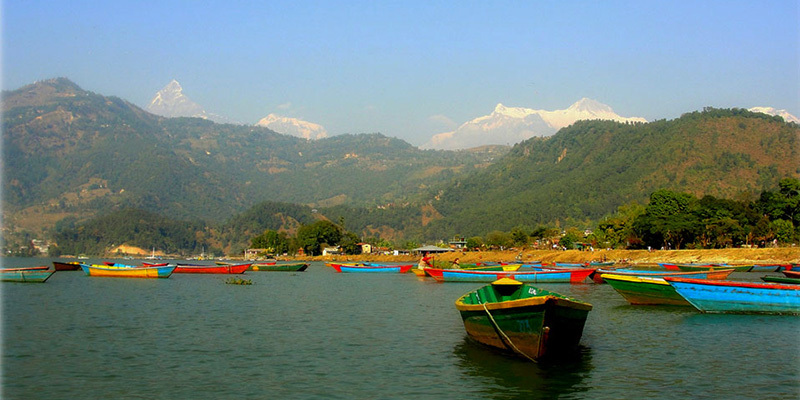 Pokhara is known as the city of lakes and the starting point for trekking destination and the second largest city of Nepal is also Pokhara. The Barahi temple in the middle of the big lake which is the most fascinating landmark in Pokhara and the reflection of snow-capped mountain in the lake is so scenic and magnificent that you will remember it for your entire life. With the closer view of Annapurna range and Mt. Fish tail you will feel close to nature and mysticism. Community Trekking in Pokhara starts as we drive from Pokhara to Galeshwor(approx 3 hours ), which is the starting point of our trek. Then we head towards Banskharka, fabulous Magar Village with deep history of producing mandarins, orange and honey. During this trek, we stay have our dinner and breakfast at community dining and sleep at local villager’s home. Today after having our breakfast, we head from Banskharka to Nangi village which is the birth place of Dr Mahabir Pun who is the concept creator of all these concept and projects. It may take 6 to 7 hours to get to Nangi village situated at 2330m. After having our instant meal, we start trekking activity and it takes walk from Nangi to Mohare Danda(appx. 8 hours). Mohare Community Lodge stands above deep gorges and valleys on the edge of a steep ridge at 3360m. Here our spacious comfortable Mohare Community Lodge offers an exclusive and perfect view of a mountains range: Dhaulagiri range , Annapurna range and Manaslu range. Mt.Dhaulagiri is the 7th and Mt.Annapurna is the 10th highest in the world. This is a perfect place for sunrise and sunset views. Today, we trek through the middle of a stunning Rhododendron forest crossed by spring streams, Dandakharka Community Lodge is one of the quietest spots on the trail – yet just a short walk from local buffalo farms that worth to visit. Trekkers have to walk through the different species of forest like Pinus pindrow, Rhododendron. After breakfast, we head all the way downhill to Tilkot. We see a small stream, terraced farm lands and ethnic villages along the way. Gradually we reach Tilkot, which is in front of Annapurna mountain and right above the Kali Gandaki. Tilkot Community Dining will serve our breakfast and dinner and we stay at villager’s house for overnight. It is situated at 2250 m altitude. Locals are Pun and Magars whose culture and tradition we will be worth to explore , learn and acknowledge about. Stay overnight at Tilkot village. Finally we drive down from Tilkot Village to Pokhara by private vehicle which ends our short, easy, unique and delightful Community trekking in Pokhara. Have breakfast in Pokhara and we drive back to Pokhara from Kathmandu. And have our Lunch on the way to Kathmandu. 6 Days trek as per program with English Speaking Sherpa Guide and porter. 02 Nights Accomodation in Pokhara with daily breakfast.